This is not the Islands’ last legislative fight over processing poi. A hundred years later, in 2011, another “Poi Bill” (SB101) was enacted after it made its way through the legislature and onto the Governor’s desk. The image shows Food Commissioner’s Poi Prohibition proclamation. 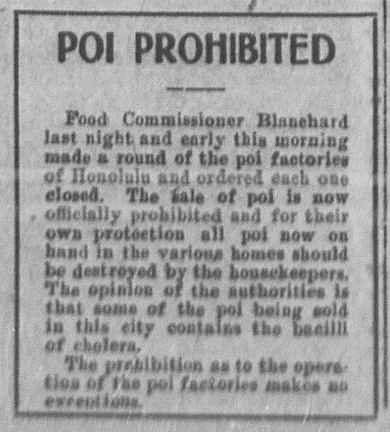 (Hawaiian Gazette, March 3, 1911) In addition, I have added other images in a folder of like name in the Photos section on my Facebook and Google+ pages.